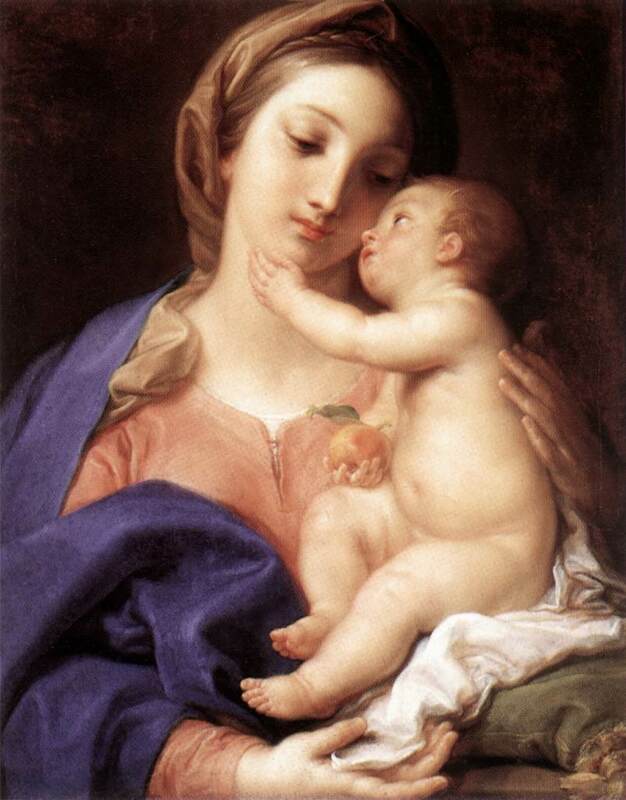 WHOLE ANGEL – WHOLE HARMONY : MADONNA AND CHILD BY POMPEO BATONI . FINDING PERFECTION IN ART, FOOD, AND LIFE BY HARMONIOUS BLENDING OF IDEAS, VALUES, AND KNOWLEDGE . Art, Food, and Life are three important dimensions of human existence. The experience of perfection in Art, Food, and Life can be promoted by harmonious blending of ideas, values, and knowledge that apparently oppose or contradict each other. Angel(Greek. Angelos. Messenger) is conceived as a supernatural, heavenly being. In various human cultures, angels are described as personal beings with bodily form and human appearance. Angel can refer to a person regarded as being as beautiful as an angel. The most important attribute of an angel is the ability to deliver messages from God in a language humans can understand. Angels assist, protect, guide, and deliver people using Divine Mercy, Grace, and Compassion. Just like an infant experiences God’s Love from his relationship with his Mother, angel is the link to make that God-Connection between man and God. The concept of ‘Spirit’ as an immaterial principle with no shape or form poses problems in developing harmonious relationships with others including God. The concept of angel presents ‘Spirit’ as a person, a beautiful person, a defender, a guide, a mentor, and a role model with whom man can interact to find Peace, Harmony, and Tranquility in his living condition. 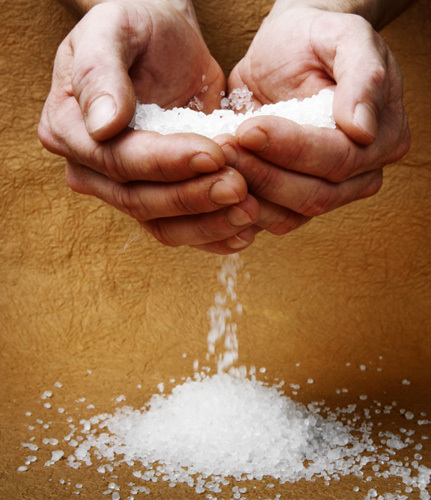 WHOLE ANGEL – WHOLE HARMONY – THE COVENANT OF SALT : THE REALITY OF SALT CANNOT BE DISCOVERED BY THE STUDY OF ITS CONSTITUENT ELEMENTS . SALT IS ABOUT EXPERIENCING THE HARMONIOUS BLENDING OF PARTS IN WHICH THE NATURE OF PARTS IS TRANSFORMED . Harmony refers to agreement or accord between various parts by combining parts in a pleasing or orderly whole. The concept of harmony includes an agreement in feeling, action, ideas, interests, etc., Harmony develops the foundation on which peaceable or friendly relations stand enduring the test of ‘Time’. Harmony involves building up ‘Systems’ that incorporate elements from sometimes contradictory constituents. For example, the substance called Salt brings harmony between two toxic elements and the harmony can be directly experienced by simply tasting that substance which is a harmonious blend of two constituents of differing natures.The concept of ‘Whole Harmony’ refers to a belief that relations between entities may transform those entities. Man is transformed by his relationship with LORD God Creator. And God is transformed for He created this universe, this planet Earth, and placed man on Earth. I examine mental concepts without any compulsive urge to either accept them or reject them. I examine ideas, values and knowledge to arrange information in an order that generates Satiation, Satisfaction, and Contentment in my probing or inquisitive mind. Such a wholesome experience of Satiation, Satisfaction, and Contentment is the source of my Happiness, Joy, and Bliss. Whole Angel is representative of Whole Harmony, the coming together of Angel of Beauty, Angel of Mercy, and Angel of Knowledge. Whole Harmony is a System of using Linguistics, Semantics, Theoretical, Practical, and Analytical Knowledge to design tools to discover true Joy, real Happiness, and Perfect Bliss while man exists as a mortal being without choice. Ann Arbor, Michigan, USA 48104-4162.